Pets give us unconditional love and endless hours of joy—no wonder we’re constantly snapping their photos! 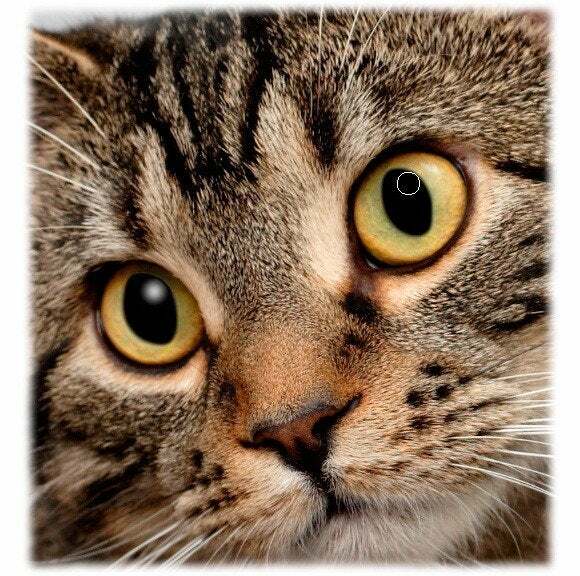 Unfortunately, it’s easy to end up with the animal equivalent of red-eye, wherein their pupils appear green, gold, or even white. 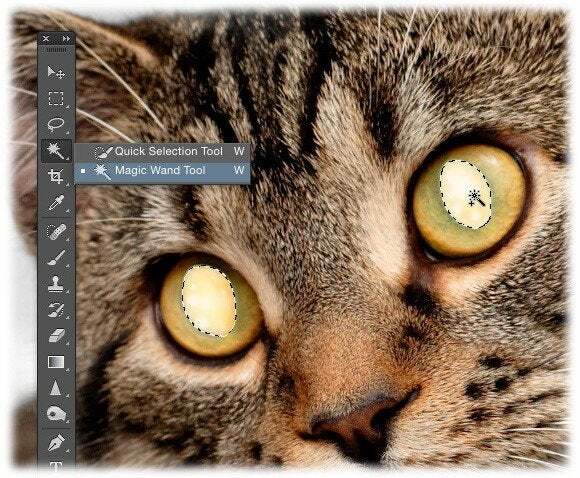 While the Red-Eye tool in Adobe Photoshop Elements 12 and later does have a Pet Eye option, you’ll get better results by rebuilding the pupils from scratch—and it’s not nearly as hard as it sounds. Open a photo and zoom in so you can see the eyes better. Press Z to activate the Zoom tool in all three programs. In Photoshop, turn off the Scrubby Zoom checkbox in the Options bar first. Now, drag to draw a box around both eyes. You can also zoom in by pressing Command-+ (plus sign) repeatedly. To reposition the photo once you’re zoomed in, press and hold the spacebar and drag with your mouse. In order to rebuild the pupils, you need to select them first. Press W to activate the Magic Wand, mouse over to one of the pupils and then click inside of it to select it. Shift-click as many times as necessary to select the entire pupil (the Shift key puts the tool in Add to Selection mode). If Shift-clicking doesn’t do the trick, increase the Magic Wand’s Tolerance setting—a higher value means more pixels will be included in the selection, while a lower number means fewer pixels will be included. In Photoshop or Elements, the Tolerance setting lives in the Options bar, though once you change it you’ll need to re-create the selection. In Pixelmator, adjusting tolerance is much easier—you visually increase it by dragging downward with your mouse. As you drag, the area that will be included in your selection is highlighted (shown here in darkish green); release your mouse button to see the new selection. To continue adding more pixels to the selection, Shift-click atop pixels that aren’t yet included in the selection, and then drag downward to adjust tolerance. Once you’ve gotten the first pupil selected, Shift-click to select the other one. When you’re finished, you should have a selection of both pupils. For the new pupils to blend properly with surrounding pixels, soften the selection’s edges. 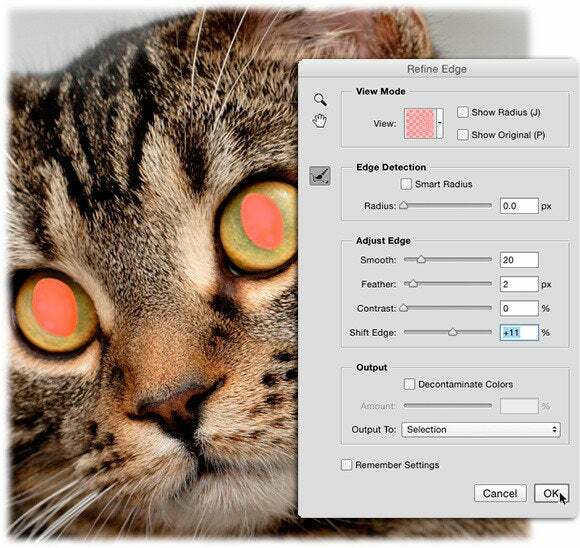 In Photoshop or Elements, click the Refine Edge button in the Options bar (in Pixelmator, choose Edit > Refine Selection). In the resulting dialog box, click the View menu and choose Overlay. 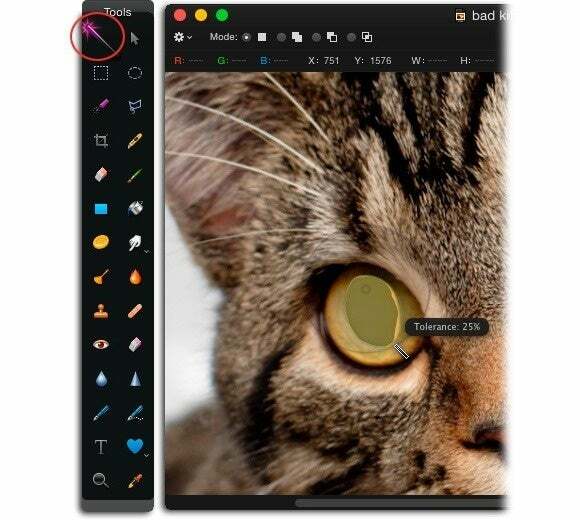 This maneuver previews your selection as a red overlay, making it easier to see atop your image (Pixelmator automatically previews areas outside of your selection in red). Next, set the Smooth amount to around 20 and the Feather amount to 2 pixels for a large image (try lower numbers on smaller images). If necessary, increase selection size by dragging the Contract/Expand slider rightward (in Pixelmator, drag the Size slider rightward). Finally, from the Output To menu at the bottom of the dialog box in Photoshop or Elements, choose Selection and then press OK (in Pixelmator, just click OK). To protect your original image, let’s fill the new pupils on a new layer. Press Shift-Command-N to add a new, empty layer. If you’d like, name the new layer pupils. Next, choose Edit > Fill and in the resulting dialog box, choose black and click OK. Depending on the accuracy of your initial selection, you may need to fill them a second time. When the pupils look good to you, choose Select > Deselect to get rid of the selection. To make the new pupils look realistic, add a light reflection or glint. Press Shift-Command-N to add another new, empty layer and name it glint. Press B to activate the Brush tool and from the Brush Preset picker in the Options bar, choose a soft-edge brush (in Pixelmator, brush options open in a separate panel, and you can just pick one that looks like it has soft edges). 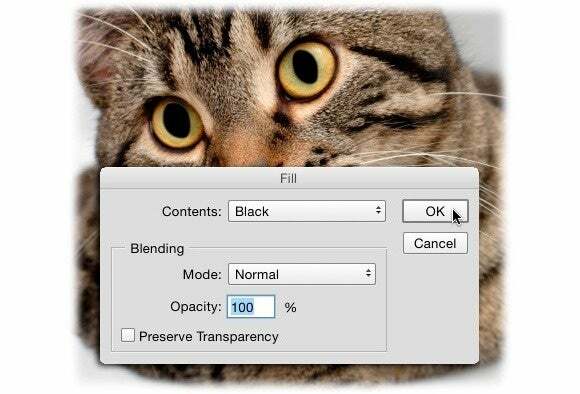 Press D to set your color chips to the default colors of black and white, and then press X until white appears as your foreground color chip (in Photoshop or Elements, your color chips are at the bottom of the Tools panel; in Pixelmator, the color appears in the Options bar at the top of the interface when the Brush tool is active). Next, mouse over to one pupil and with your brush cursor positioned a few pixels from the pupil’s edge, use the left/right bracket keys on your keyboard to adjust cursor size so it’s approximately one-quarter of the pupil size, and then click once to add a glint. 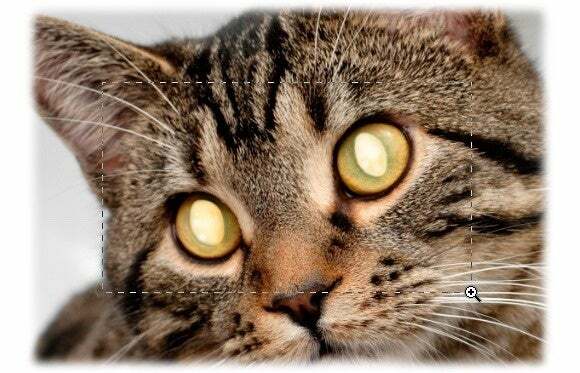 Mouse over to the same spot in the other pupil and click to add another glint. In the Layers panel, lower the opacity setting of the glint layer until it looks realistic to you (say, 75 percent). 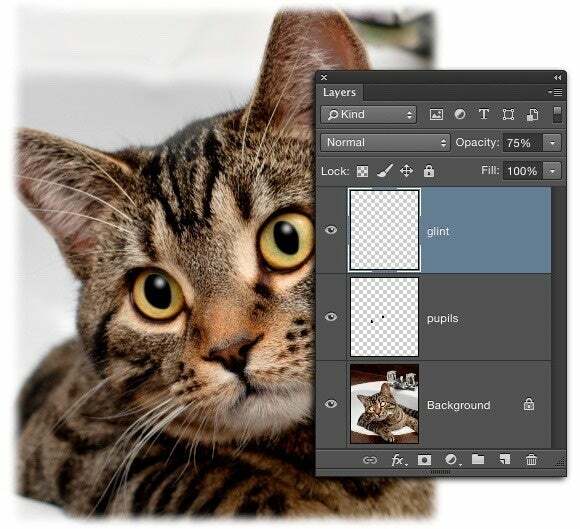 Choose File > Save As and pick Photoshop (or Pixelmator) from the Format menu so your layers remain intact. To create an image suitable for email or posting online, choose File > Save for Web and pick JPEG from the format menu at upper right (use the height and width fields at lower right to change image size if you need to). In Pixelmator, choose File > Export and then click the JPEG icon. Here’s the final result, including the Layers panel. 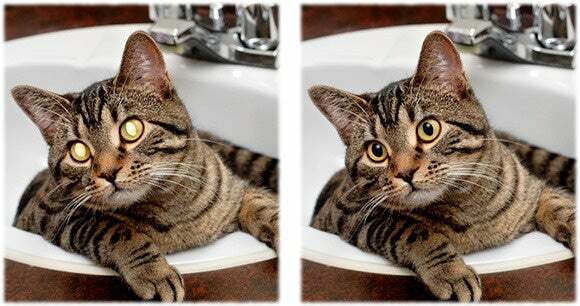 As you can see, your pet can go from creepy to cute in just a few minutes. Until next time, may the creative force be with you all.